The HP Laserjet Cm2320fxi Mfp is a colour laserjet all in one printer that meets the demands of small offices and large business groups. It is capable of printing, copying and scanning the documents smoothly. The device uses HP ImageREt 3600 to enhance images and to reproduce colours accurately. 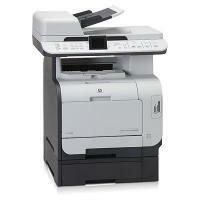 It supports three colour HP Laserjet Cm2320fxi Mfp toner cartridges which eliminate the wastage of colour ink. The device weighs 76.94 lbs approx. and measures 19.6 x 19.4 x 25.6 inches respectively. The printer supports ADF which can handle up to 50 sheets of paper. It is equipped for networking with built-in Ethernet, a USB port, and slots for memory cards. It also allows users to print directly from the printer, and scan to the computer or to email. This multifunction printer is capable of automatic duplexing, helping in reducing paper waste and save money on paper costs. The fax machine on this device is able to transmit faxes at a transmission rate of 33.6 Kbps and features fax forwarding, dual-line capability, automatic redialing, and a junk fax barrier. The device can handle different print medias which include bond paper, cards, envelopes, labels, photo paper, plain paper, recycled paper and transparencies. The maximum printing resolution of this printer is 600 x 600 dpi for both monochrome and colour files with print speed up to 21 ppm. It saves energy consumption by using only 460 watts of energy during operation and 27 watts of energy during standby mode. The input tray of this printer can handle up to 550 sheets of paper, while the output tray can store up to 150 sheets of paper. The printer uses CCD scan element to scan the documents with scan resolution up to 1,200 x 1,200 dpi. The HP Laserjet Cm2320fxi Mfp is an impressive sounding all in one printer with some good features which include automatic duplexing, ADF support, ethernet and USB connectivity, image enhancing features and supports memory card slots for direct printing. However, it's expensive and low yield cartridges, lack of Wi-Fi connectivity and low print speed does not make it a good choice for business workgroups who are concerned with productivity. What to do when toner marks repeatedly appear at even intervals on the printed side of the page? A. The HP Color Laserjet Cm2320fxi Mfp printer is a heavy duty printer that is capable of printing, scanning as well as copying. This printer was designed for businesses and small/medium offices. However, the Cm2320fxi can fulfill your purposes at home as it supports different types of paper that you can print on directly using a memory card, but you can still find cheaper alternatives that are suitable for home purposes. Q. Will any damage be caused to my printer if I use compatible HP Color Laserjet Cm2320fxi Mfp toner cartridges for printing? A. Absolutely not! All our toner cartridges are of high quality that has been factory tested. They will work with your printer without any hassle and you do not have to worry about any damage caused to the printer. Q. How do I print photos directly from a memory card with my HP Color Laserjet Cm2320fxi Mfp printer? Insert the memory card into your printer. The Photo Menu will be displayed. Use the arrow buttons to select Easy Print and then press OK. Select “Individual Photo” or “A range of photos” or “All photos” and then press OK. Enter the photo number or range of photo numbers. Set the number of copies to print (1 to 99). When the message to print appears on the control-panel display, press OK. to start printing. Q. How many pages can I print with your compatible HP Color Laserjet Cm2320fxi Mfp toner cartridges? A. Our compatible HP Color Laserjet Cm2320fxi Mfp toner cartridges are high yielding cartridges. The black compatible toner cartridge can print up to 3,200 pages, cyan, magenta and yellow toner cartridges can print up to 2,600 pages each without having to be replaced. Q. Are the prices of the HP Color Laserjet Cm2320fxi Mfp toner cartridges inclusive of delivery? How long would it take for the product to be delivered to me? Q. How can I check the remaining ink of the cartridges by printing the supply status page? A. The supply status page is used for indicating the estimated life remaining in the print cartridges. It lists the part number for your printer so that you can order for the replacement of the HP Color Laserjet Cm2320fxi Mfp toner cartridges when required. It also aims in providing other useful information related to the printer. Q. How can I reprint the faxes that are stored in memory? A. You can reprint a fax if the HP Color Laserjet Cm2320fxi Mfp toner cartridge was empty or the fax was printed on the wrong type of media. The amount of memory that is accessible will determine the actual number of faxes that are stored for reprinting. The new or recent fax is printed first and the old one that is in the storage, prints last. These faxes are stored continuously. Reprinting them does not clear them from the memory. To clear these faxes from the memory, you need to delete them. Refer the manual provided in order to delete the faxes from the memory. Q. What type of paper size does the HP Color Laserjet Cm2320fxi Mfp printer use? A. We always recommend to use the good quality paper to serve your printing purposes. The printer takes A4 size as the standard paper size for printing any document. Q. Do you offer XL print cartridges for the HP Color Laserjet Cm2320fxi Mfp printer? A. No, we are not provided with the XL range of HP Color Laserjet Cm2320fxi Mfp toner cartridges on site. Q. What is the print cartridge limited warranty offered for the HP Color laserjet printers? A. The HP products are warranted to be free from defects in terms of materials and workmanship. It focuses on providing the best customer service to its users. Once the product is delivered, the risk of damage to or loss of the item passes to you. If the problem has arisen by accident, misuse or negligence, or the warranty period has passed, we will not be responsible for it. All warranty repairs will be returned to you at the cost of Wholesale Ink Ltd.
Q. How HP Color Laserjet Cm2320fxi Mfp gives easy and cost-effective printing solution? A. We offer high-quality and compatible ink cartridges at many affordable prices. The built-in quality makes these HP laserjet printers cost-effective. One can easily print about 3200 Pages through black ink cartridges and about 2,600 Pages through colour cartridges. Designed for easy, reliable operation these HP Color Laserjet Cm2320fxi Mfp toner cartridges save time and money thus increases productivity. Q. Various Print quality problems occur while using the printer for so long. What measures can be taken to get rid of such issues? A. Occasionally, you might encounter with certain print quality issues. The information given below might help you to resolve them. The media might not meet HP specifications. Use the media that meets HP specifications. If print is light do not use inkjet paper. One or more HP Color Laserjet Cm2320fxi Mfp toner cartridges might found defective. In that case print the supplies status page to check the remaining life of the cartridges. It is always recommended to use the cartridges within 6 months of first use. You might receive low prints when the printer is set to override the replace [color] cartridge message. Replace any low print cartridges immediately when receiving an error message for replacing the cartridges. The device is not set to print on the type of media on which you want to print. In the printer driver, select the paper tab and set the type to match the type of paper on which you are printing. Printing speed might be slow if you are using heavy paper. The Internal parts might have toner on them. The problem typically gets corrected after printing few more pages. The paper path might need cleaning. Clean the paper path and see the fuser might not get damaged or dirty. To determine if the fuser has a problem, open the HP ToolboxFX and print the print-quality diagnostics page. Test the print result. Contact HP Support if the problem is still not resolved. A HP Color Laserjet Cm2320fxi Mfp toner cartridge may have a problem. To determine which cartridge has a problem, open the HP ToolboxFX and print the print-quality diagnostics page. Q. Why is my printer taking so long for printing any document? A. If your printer is taking a long time to perform printing function, this could indicate an issue with the connection or may be the HP Color Laserjet Cm2320fxi Mfp toner cartridge gets low on ink. To resolve this, you need to address each possible fault once. Firstly, check that everything is properly connected. Check the settings on your PC, laptop or mobile device to ensure that everything is fully linked up. If everything appears okay with the connection, check to see that the file is safe. If there is an issue with the file, then it is likely that the document will not print. A simple way to test this is to double click on file to open. If an error message pops up, and the file does not open, then there is a strong chance that it is corrupt. Again if everything is working correct check the life of the HP Color Laserjet Cm2320fxi Mfp toner cartridges if gets expire. It is highly recommended to replace cartridges in such case. Q. I have just installed my new compatible HP Color Laserjet Cm2320fxi Mfp toner cartridges and facing the problem of blank printouts what should I do? A. In case you receive blank printouts while printing any document. Firstly check that the sealing tape has been removed from the new cartridges. Remove the seal from the cartridges in case it is there and try printing again. If still the problem not resolved try reinserting the cartridges. Call the customer support executive in case the problem remains.